The 2018 Primary Election will be held on Tuesday, May 15. The polls will be open between 7:00 a.m. and 8:00 p.m.
You must be registered to vote to participate. You can register online by clicking here or in person by visiting the Lebanon County Voter Registration office at 400 S 8th St, Room 209 in Lebanon. The deadline to register to vote, or to switch your party affiliation, in order to participate in the general election is April 16. Am I required to vote in person? Yes, unless illness, disability, or duties related to your military service, occupation, or business prevent you from voting in person. In such cases, you may vote by absentee ballot. Click here for a printable application for a civilian absentee ballot. The deadline for applying is November 1. If you cannot vote in person due to military service, you may request an official absentee ballot by using the Federal Postcard Application (FPCA), available at www.votespa.com or www.fvap.gov. 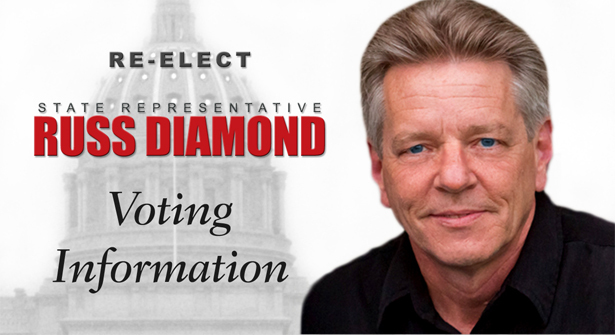 You are urged to apply early - and of course, be sure to cast your vote for State Representative Russ Diamond! Where do I go to vote in the Primary Election? Use the list below to find out where to cast your vote. If you are unsure which polling place is the correct one in your municipality, it is listed on your voter registration card. You can also check with the Lebanon County Voter Registration office at 400 S 8th St, Room 209 in Lebanon by calling (717) 228-4428. Click here for a printable list of polling places in the 102nd district.